We've combined our travel writers and readers' advice into one big happy campers' guide for summer. Nothing says summer like a freshly pitched tent in the countryside. Ok, that tent can be battered by rain, bent out of shape by an over-eager Dad, or ruined by neighbours from hell, but the image remains irresistible. 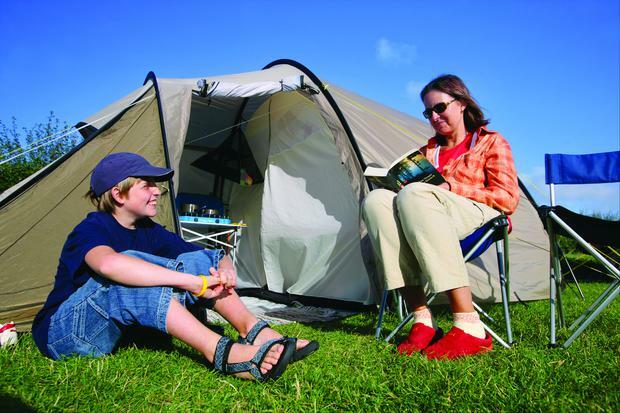 At its best, camping offers a holiday where you can do what you want, when you want. At its worst, without proper preparation, it can be a nightmare. Here are our top tips for making sure it works out! "We always advise our first-time campers to do a trial run in their garden and don't forget to pack the instructions (or tent pegs!) for when you arrive," advise the good folk at Woodlands Caravan and Camping Park (kingdomcamping.com) in Tralee. It's a tad less mortifying making mistakes in your garden, too. When do I tell him I forgot to bring food? That differs depending on the type of camper you are, but camping beds, bedding, cooking equipment and lights are essential for everyone. Make sure to pack good rain gear, sunscreen and a warm fleece too. Irish weather has been known to have a laugh, after all. Getting a kit list that works for you, and one that fits your car, is easier said than done. It pays to check forums, ask around, and practise before you hit the road. What kind of camping experience are you looking for? It's worth having a chat about this before you go - one person's camping heaven can be another's holiday hell. The Irish Caravan & Camping Council's website (campingireland.ie) offers the facility to search some 150 camping and caravan sites on the island by name, location or type. "Make sure to ring ahead to book your pitch to avoid disappointment," it says. Some (but alas, not all) sites can be booked online, and you can also use the booking engines on Pitchup.com or Campsited.com. While you can secure a last-minute place midweek or off-season, it's foolish to bank on one in peak months. Wild camping is dealt with in a separate point, below. 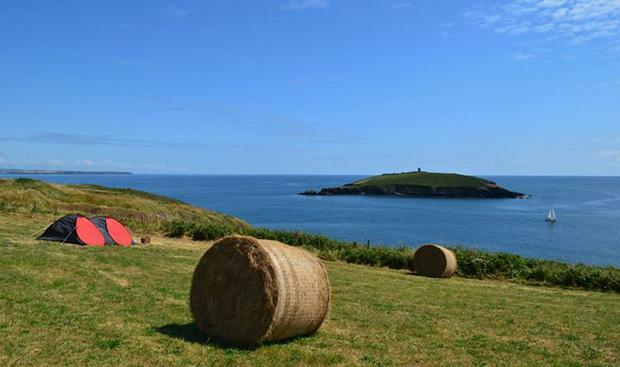 Camping arguably offers the best value of all holidays, with a pitch for two adults and two children starting from as little as €23 (provided you have your own tent, of course) in some Irish sites. Further savings can be had by investing in a Camping Key Europe (€16), which entitles the bearer to discounts such as 10pc off Stena Line ferry crossings or nightly pitch rates, for example. Order one on campingireland.ie. Camping doesn't have to involve sleeping bags and smoky stoves. Glamping - or glamorous camping - can take many forms, and in recent years, there's been a noticeable rise in the number of bell tents, log cabins, micro-lodges, Romany-style caravans and more cropping up in parks throughout Ireland. 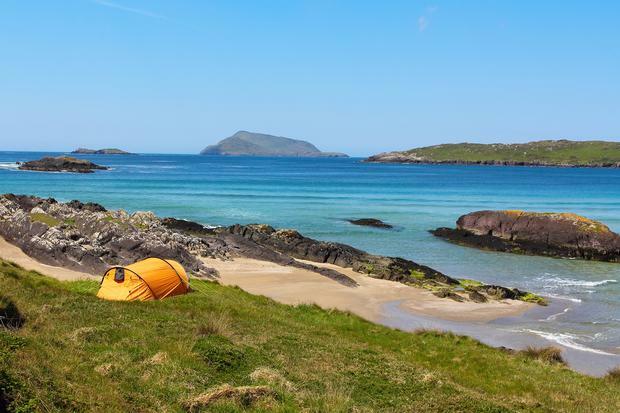 “We are regularly contacted by people who would love to camp, don’t have the equipment and would like to do a trial run before they invest in their own tent and other equipment,” says the Irish Caravan and Camping Council. Some sites to try? Battlebridge Caravan & Camping Park (battlebridgecaravanandcamping.ie) has cosy eco-pods, treehouses and quirky shepherd’s huts from €25pp per night; Pure Camping (purecamping.ie) on the Loop Head Peninsula offers furnished bell tents, new eco-huts and yoga classes, and Keel Sandybanks Caravan and Camping Park on Achill Island (achillcamping.ie) features bow-topped Romany caravans that can accommodate two adults and two kids from €115 for two nights. John Brennan (of At Your Service) has also pioneered ultra-luxury glamping in Ireland at Dromquinna Manor (dromquinnamanor.com), where a dozen or so bespoke canvas tents from India overlook Kenmare Bay. Rates in the tents, which feature hand-crafted beds and private verandas, start from €150 based on two sharing. Got a question about camping? Ask other campers. That's the surefire way to get the best advice, from campsites and equipment others have loved (and hated)... right down to the correct tyre size for your caravan. Try campsitereview.com, motorhomecraic.com/forum, icc.ie/forums and motorcaravanclub.com for starters. All pitches are not created equal. Don't feel obliged to take the first site you are shown in a camping park, especially if you plan on staying for several days. Have you young children that may make a pitch close to the showers and kitchens more desirable? Or would you prefer a quieter spot away from fellow campers going back-and-forth to the facilities? What about your neighbours? Are you downwind from a smoky fire? "Beware of trees," adds the ICCC. "The shade of a tree can look appealing, but the grass is often poor because it’s protected from the rain, trees can drip sap and birds have a habit of roosting and leaving little presents on your lovely unit beneath." "Rain will also drip from trees long after a storm has passed." Not all camping takes place in the countryside. What about considering a campsite for an affordable city break in Dublin, for instance? Camac Valley (camacvalley.com) offers a host of pitches just off the M50, and though it gets a lot of business from concert-goers and ferry passengers, facilities including a children's playground, putting green, free Wi-Fi and 24/7 security make it handy for families, too. The site opens year-round, with caravans, tents and motorhomes from €20 per night. 9. Leave the BBQ outside! It sounds ridiculous, but never cook or bring a portable barbecue into your tent. Apart from the obvious fire hazards, even a cooling barbecue gives off poisonous carbon monoxide (CO), which can kill. Better safe than sorry. It's possible to pitch a tent anywhere, but officially you need the permission of the landowner - the local council, for instance, or a private owner such as a farmer. Some local authorities have bylaws preventing camping or overnight parking in certain areas, and of course, some landowners police 'trespassers' more than others. "I really love campsites - love 'em - but there's still nothing like pitching-up in some field/mountain/cliff in the back end of Ballynowhere," says Thomas Breathnach, one of our top travel writers. "I don't think we Irish do it that much - which is a shame!" "I did it last summer near when I'm from in East Cork (photo, above). It was so much craic - and you get a much better connection with a place than with a conventional site. The etiquette is a fun novelty too: finding and getting permission off the farmer to use his land (maybe bringing a bottle of booze to say thanks) and so on; then sorting out all the sanitation/ablution side of things." "It was unreal - and so simple. I think the way trends are going too, more people are turning to 'earthier' encounters instead of glamping - which can be a bit gimmicky at times (and pricey too)." See leavenotraceireland.org for more. For its part, the ICCC (campingireland.ie) says there are over 150 graded and registered caravan and camping parks on the Island, and that these parks offer a secure and safe place to overnight with top class facilities. "We urge visitors to stay in one of these registered sites and enjoy the comforts and facilities on offer," it says. Agree? Disagree? Have your say! Got any camping tips to share? Email us at travel@independent.ie, Tweet us at @indo_travel_ or get in touch on Facebook here. We'll add the best tips! NB: This article has been updated to reflect price changes etc.